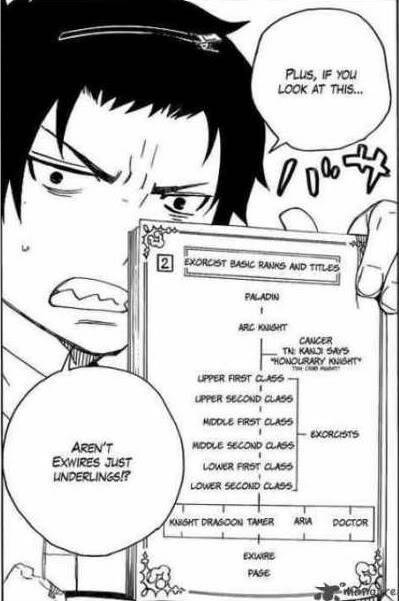 In order for an individual to become an exorcist, they must obtain the title of a 'meister'. A meister is a general term for an exorcist's style of combat; an exorcist can acquire more than one. The fighting styles are classified into five categories. Dragoon: Meisters that fight using ranged weapons, mainly guns. Normal round will not affect demons so a Dragoon might use silver-jackal bullets or holy water capsule bullets, you can come up with any type of ammunition you want as long as it has some sort of holy affinity for demon killing purposes. Tamer: Exorcists who can summon and control demons to fight. These demons are called 'familiars'. In order to summon a familiar, a magic circle is needed; it can be drawn on the ground or on paper. The meister then draws their blood onto the magic circle and recites any words that come into mind. However, if the magic circle is erased or torn (on paper), it loses its effect and the familiar disappears. It has been noted that the talent to be a Tamer is rare, since sheer spiritual fortitude is needed to tame the demon; natural talent is also essential. However, if the Tamer lacks confidence, the familiar will attack the meister. Advanced tamers can summon more than one familiar. STILL UNDER CONSTRUCTION, give us time to work out the kinks in insta-killing demons by talking. Aria: Many demons have weak points known as "Fatal Verse", in which an exorcist recites a specific passage from holy scripts that causes their death. An Aria fights by finding a demon's "Fatal Verse" and recites holy texts, including the Bible and other sacred scriptures. Arias must have a talent for memorization; however, they are completely defenseless once they begin reciting the demon's "Fatal Verse", for the demon will attack the meister to stop the recital. Doctor: An advanced Meister who has the knowledge to heal wounds and injuries inflicted by demons and generally has a second specialization such as a Knight, Dragoon etc. As a doctor you are first and for most a field medic, your abilities in fighting will not be as good as one whom only specializes in Knight, Dragoon etc. Regardless, you are a major asset to any team and are very much needed. The Paladin: The highest title only awarded to the strongest of all exorcists. This title will only be given to someone who has stayed active for 7 days or more and displays a mastery of both RP and most of what we know about Blue Exorcist so far. After all...this is..the best of the best. The Masho are the demons of Gehanna, they travel through gates to get to the world of Assiah. The Masho group will include everything ranging from those lower class demons who can only retain a bestial form, to those of upper class demons who take to possessing humans and taking on a human for as well as displaying their demonic attributes upon their human before turning to their full demon form. Students are those whom attend True Cross Academy as "innocent bystanders" They honestly have no knowledge of the Masho or of the Exorcist that they often call "Teacher" or "Classmate" The go to the large school as if they didn't have a care in the world and don't generally see the weird happening between Exorcist and Masho due to the fact that the Exorcist area's are only accessible via magical keys and mere humans cannot see a Masho without first being injured by one.